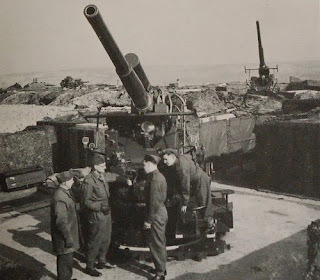 Known popularly as "ack-ack", guns available ranged from the pintle-mounted .303 machine-guns, through to 20mm cannon, the 40mm Bofors and the 3.7-inch QF, which was the primary heavy anti-aircraft gun, the equivalent of the German 88mm, with a slightly larger calibre of 94mm. While the Germans allocated their heavy FlaK to Luftwaffe units, anti-aircraft guns in British service, apart from light calibre weapons for local defence, were operated by the Army personnel. Organisationally, they came under the Anti-Aircraft Command, formed in 1 April 1939 under General Sir Alan Brooke. 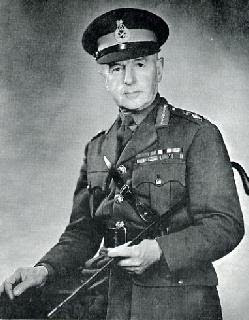 He passed command to Maj Gen Sir Frederick Pile (pictured) in July 1939, who remained in command until the end of the war, under the general operational direction of RAF Fighter Command. The Command HQ was based in the grounds of Bentley Priory, home of Fighter Command. After the end of the war, Sir Hugh Dowding was to say that, in theory, the Commander-in-Chief, Fighter Command was the authority responsible for settling the dispositions of all guns allotted to the Air Defence of Great Britain. But, he said, this was little more than a convenient fiction. The number of guns available was so inadequate for the defence of all the vulnerable targets in the country, and the interests concerned were so diverse and powerful, that it was not to be supposed that an individual member of any one Service would be left to exercise such a prerogative uninterruptedly. A disproportionate amount of his time was taken up in discussions on gun distribution, and each decision was at once greeted with a fresh agitation, until finally he had to ask that all proposals should be discussed by a small Committee on which all interests were represented. Dowding normally accepted the recommendations during quiet periods. During active operations he consulted General Pile, and the pair acted according to our judgment. At the start of the war, the Command consisted of seven anti-aircraft divisions. At its height, it numbered over 350,000 personnel drawn from the Royal Artillery, the Royal Engineers, the Auxiliary Territorial Service (the women's branch of the Territorial Army), the Royal Marines and the Home Guard. However, at end of July 1940, the Command had only a half of the heavy and less than a third of the light anti-aircraft guns considered essential. It was desirable to protect aircraft factories, airfields, ports, naval bases and industrial areas, but priority had to be given to the first of these. When the Germans switched their assault onto London, many guns had to be moved immediately to its defence. Despite the problems, anti-aircraft guns claimed approximately 300 German aircraft shot down during the Battle of Britain. Another problem was the lack of trained manpower. 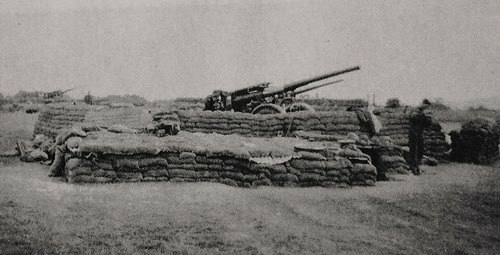 The Territorial Army operationally manned the seven divisions of Anti-Aircraft batteries but lacked the necessary training required against the modern aircraft of the Luftwaffe. Many experienced men along with guns were lost during the campaigns of Norway and France so by July 1940 Anti-Aircraft Command resources were seriously stretched. For many new recruits the field of combat would become their training ground. By July 1940 as the Battle of Britain unfolded, there were in place around the UK 355 x 4.5-inch, 620 x 3.7-inch and 230 x 3-inch heavy guns operational along with 270 x 40-mm Bofors, 135 x low-level 3-inch, 140 x ex-navy 2-pounder and 40 x Hispano 20-mm cannon low level guns for the country's defences. Also within the Command were the vitally important searchlights, for which approval had been given for 4,128 Light Batteries. At the start of 1940, though, there were only 2,700 operational. Searchlights were vitally important during night-raids as they hunted for air targets by combining the use of sound and radar location. Searchlights were deployed in single light stations at approximately 6,000 yards spacing throughout the area, but with a closer spacing in certain instances along the coast and in "gun defended areas" where the distance between lights was approximately 3,500 yards. These lights were deployed on a brigade basis following RAF. sectors, and each light was connected by direct telephone line and/or RT set No. 17 to Battery Headquarters via troop HQ and thence to an army telephone board at the R.A.F. Sector Operations Room. The equipment of a Searchlight site consisted of a 90cm Projector with, in most cases, Sound Locator MkIII. In some instances sites were equipped with Sound Locators MkVIII or MkIX. During the late Summer and Autumn the number of MkVIII and MkIX Sound Locators gradually increased, and VIE. equipment and 150cm Light Projectors were introduced. Developed in the late thirties from a British Army specification for a weapon between the then current 3 and 4.7 inch calibre Anti-Aircraft guns. Research suggested that a 3.7-inch gun firing a shell of approximately 25lb weight could fill the gap. Thus, in 1933, a specification for a 3.7" gun weighing eight tons was issued. The gun had to be capable of being put into action in 15 minutes and of being towed at 25mph. A design by Vickers-Armstrong was accepted and the pilot model passed proof in April 1936 with production being authorised a year later. The first production guns were delivered in January 1938. It was extremely advanced and complicated, yet regarded as one of the best of its type. The first production model could fire a 28lb 94mm shell to 30,000 feet at a rate of 20 rounds per minute. It was crewed by seven men or, from 1941 onwards, increasingly by women when deployed for Home Defence. Production was initially slow, particularly due to its complicated carriage but modifications to the design to simply it for production helped and peak production was reached for guns in March 1942 (228) and for mountings June 1942 (195). The guns were made in the United Kingdom until 1943 and then in Canada for the rest of the war. Unlike the Germans, who used their 88mm guns as both anti-aircraft and anti-tank, the QF 3.7 was too heavy to be used in mobile warfare and was damaged by low elevation firings. The last version, Mark VI, was only employed in static positions. The guns were normally deployed as batteries of four, either in the open or with temporary sand-bag protection or from fixed emplacements of increasing sophistication. The fixed emplacements were most often clustered in a horse-shoe layout see left, around a command post. The battery would often operate in unison with searchlight batteries, accoustic detectors and radar. 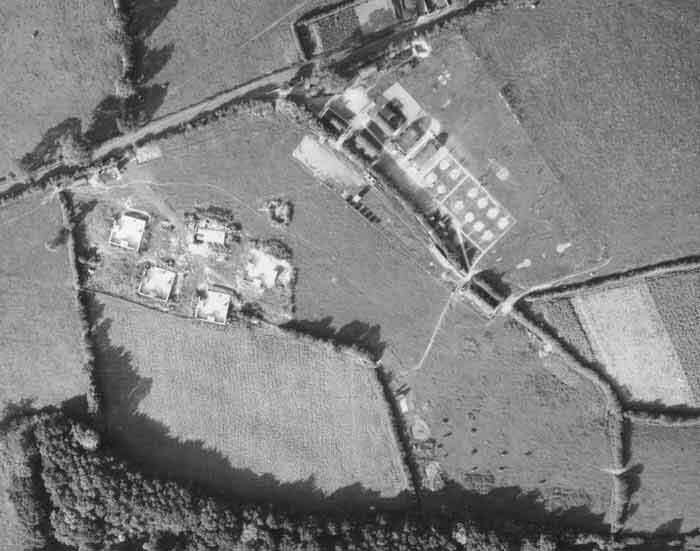 Searchlights, which also came under the control of the Anti-aircraft command, were more plentiful than guns, nearly 4,000 being available towards the approved total of 4,128. In daylight, their crews had the important function of reporting air activity to the gun operations rooms. Supplement to the London Gazette of 18 December 1947: The Anti-Aircraft Defence of the United Kingdom from 28th July 1939 to I5th April 1945.